Rajasthan Chief Minister Vasundhara Raje on 25th February inaugurated a medical project Rajasthan Heart Attack Treatment programme (RAHAT), launched by a private hospital in Jaipur.The programme is a ST-Elevation Myocardial Infarction (STEMI), a very serious type of heart attack, management telemedicines platform that captures and transmits patient's EKG along with clinical history from remote geographical locations to heart command center hub.A team of expert cardiologists at HCC-Hub provided immediate EKG interpretation and real time STEMI guidance and management via tele-consultation by instantly recognising fatal EKG abnormalities. 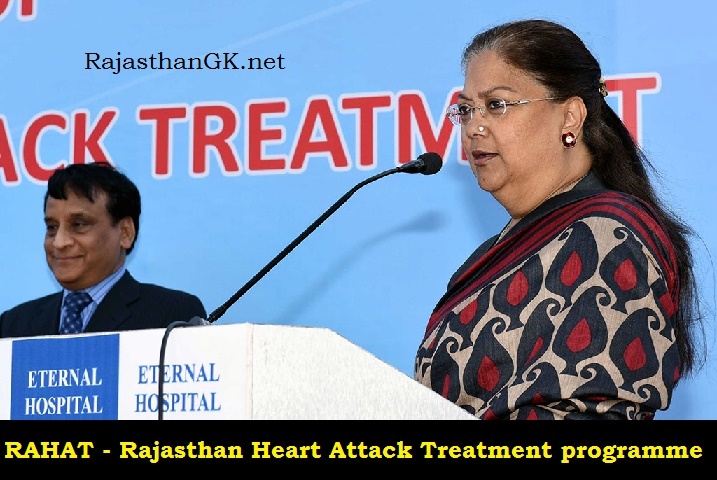 Raje said the such projects will enhance the medical services in the state. The Project aims to provide timely treatment to those who undergo heart attack in rural and remote areas. Under it, the patients suffering a stroke would be provided with immediate ambulance service and telemedicine service. While basic treatment would be provided to the patient in the ambulance on the way to the nearest hospital, the details of the same would be shared with the experts at the HCC through tele-consultation. RAHAT Project will enhance the medical services in the state.